Lou Gehrigs disease, also known as amyotrophic lateral sclerosis, is an incurable condition. However, some people are affected less than others, and it is possible to slow it down dramatically by applying some lifestyle changes. 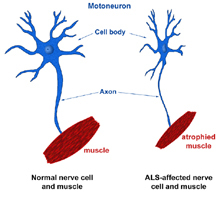 Amyotrophic lateral sclerosis, or ALS, is a progressive neurodegenerative disease. It targets the nerve cells in the brain and spinal chord, thereby slowly destroying the mind’s ability to control muscle functions – the “motor control”. Motor neurons are used for the “communication” process between the brain and the muscles – and when these die, the brain eventually loses control over all muscle activity – including breathing and heartbeat. While there is still much debate about the exact cause of Lou Gehrig’s disease, it is known to be hereditary. It has been connected to a genetic defect of the superoxide dismutase gene. This gene is connected to the body’s ability to manufacture natural oxidants – superoxide dismutase, or SOD. Constantly insufficient levels of SOD leaves the nerve cells vulnerable to attack from free radicals (unstable oxygen molecules). The constant decrease in nerve cell numbers eventually reduces “motor control” – which eventually leads to paralysis. Symptoms of Lou Gehrigs disease or ALS include gradually reducing muscle function and -strength, which eventually leads to paralysis. However, these symptoms only occur in around 60% of sufferers. As the muscles stop receiving communications from the brain, they start waste away, or simply put, grow thinner – a process of atrophy. Early stages are marked by muscles weakening (especially notable in the arms and legs), and increasing difficulty in breathing, speech and swallowing. In its early stages it can be recognized by tendencies (of the sufferer) to drop things, abnormal fatigue of the limbs, muscle cramps and twitches. The lack of control results in some people easily tripping, slurring, and even falling into uncontrolled laughter or crying. There are, unfortunately, no known cures for Lou Gehrigs disease – neither to halt it nor to reverse the damage. However, it has been established that it can be slowed down, even dramatically so in some cases. Currently, there is one drug, Rilutek (approved by the FDA), that has proven moderately successful in slowing down the progression of the disease. There are some drugs currently undergoing clinical trials, some of which seem promising. It is possible to treat the disease (to an extent) yourself. In the early stages, some gentle stretching and light exercise will help to maintain muscle condition, and combat fatigue. However, the real treatment lies in addressing the shortage of antioxidants in the body. The inside of the human body is intended to be slightly alkaline. When treating Lou Gehrig’s disease, the alkaline state of the body should be more pronounced. This requires the consumption of fresh organic fruits and (preferably) raw vegetables. Take note that the alkaline nature of foods is not determined by their natural state – but it concerns their nature after digestion. Avoid all kinds of meat, refined grains and starches, wheat, processed foods and fast food. Avoid unhealthy oils like vegetable-, canola-, soy-, and any hydrogenated oils. Rather use olive-, safflower- or macadamia oil. If available, drink alkaline water. There are a number of herbs that assist in combating ALS – like cayenne, cinnamon, goldenseal root, ginger, and more. Other herbs like nerve root, valerian root, and passionflower have been used with some success to do some repair on the nervous system. Ultimately, the diet should be alkaline, with plenty of antioxidants.